Pro Light is more powerful, and is easy to use than any fin on the market. The unique polypropylene blade material provides a variable flex that adjusts during the kicking cycle. The blade is extremely flexible and has snap requiring less kicking effort. The side stringers that extend all along the blade and two flaps situated along the end of the blade itself make the fin very directional. Cressi is the first company to recognize the performance value of the foot pocket. The Pro Light's foot pocket is made of a comfortable elastomer material and is computer designed to give ideal transmission of leg-fin thrust the blade becomes a true extension of your leg. The blade originates from the upper part of the foot pocket, with a 20% increase in useful surface area compared to a traditional fin of the same length. The unique foot pocket design keeps the diver's heel from extending over the end of the foot pocket. This transfers the kicking load to the diver's heel, rather than the middle of the foot and eliminates foot fatigue and cramping. Pro light's foot pocket is extra wide with soft expansion sides for extreme comfort. Fin is equipped with impact and corrosion resistant quick-release buckles with quality rubber straps. The Pro Light is a generous fin that provides exuberant performance without too much physical effort. These fins are perfect both for beginners and for professionals and are very common among instructors and technical divers. Blade made in dual material: strong polypropylene and soft elastomer for ensure lightness and well-balancing. Full length side-rails help direct waterflow for improved thrust. Elastomer foot pocket improves comfort. Blade extends from the top of the foot for increased surface area. 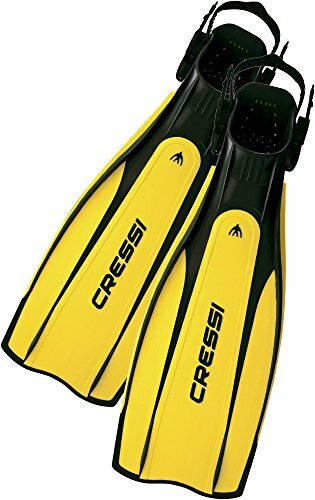 The Pro Light is designed and made in Italy by Cressi, a brand pioneer in Scuba Diving, Snorkeling and Swimming equipment. If you have any questions about this product by Cressi, contact us by completing and submitting the form below. If you are looking for a specif part number, please include it with your message.